Childhood Cancer Awareness Month provides a clear reminder of the need to further support cancer research for kids. Every day, 43 children in the United States are diagnosed with cancer. In Indiana, Riley Hospital for Children at Indiana University Health treats an average of 200 new pediatric cancer cases as well as 350 ongoing cancer patients each year. In the past 20 years, only three new cancer drugs have been approved specifically for children. Funding for research is vital to finding more effective treatments to not only cure pediatric cancers, but lessen the effect of the drugs that save cancer patients’ lives. Michael and Marci McCauley’s daughter Cierra, Elizabethtown, Ind., was diagnosed with Hodgkin’s lymphoma in 2012. Thanks to Riley Hospital, today she is cancer free and a healthy 10-year-old. As breeders of race horses, the McCauleys capitalize on a nationwide network of jockeys willing to wear a gold ribbon on their riding boot throughout the month of September. “I want the gold ribbon to be as recognizable as the one for breast cancer awareness,” says Michael. The Barrett Family, Terre Haute, Ind., launched the “P.S. We Love You Campaign” in memory of their son Patrick who passed away in March 2016. A cancer patient at Riley Hospital, Patrick was the first patient to take part in the Pediatric Precision Genomics program which devises personalized treatment plans for kids with cancer. The Barrett family wants to ensure all families have access to this program. The Symmes Family, Carmel, Ind., launched the Caroline Symmes Endowment for Pediatric Cancer Research in memory of their daughter. The foundation focuses on raising funds to support research of solid-cancer tumors, and is fueled by the lack of priority for public funding. To date they’ve raised $2 million in gifts and pledges and their efforts will support Jamie Renbarger, M.D., as the Caroline Symmes Endowment Scholar. Dr. Renbarger is leading the Pediatric Precision Genomics program. Riley Hospital and the Wells Center for Pediatric Research is at the forefront of research to find a cure, with pediatric research and patient care a major funding priority for Riley Children’s Foundation. Riley Hospital is Indiana’s only provider of pediatric stem cell (bone marrow) transplantation, used to treat certain types of cancers such as leukemia and lymphoma. The Riley Cancer Center has approximately 10,000 outpatient visits and 900 hospital admissions each year. Riley Hospital launched the first Pediatric Precision Genomics Program to create personalized treatment for kids with aggressive cancers. 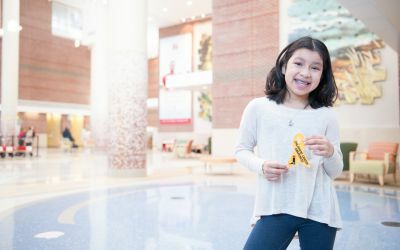 Children at Riley benefit from the latest in pediatric research through a Children’s Oncology Group clinical trial which provides collaboration amongst the nation’s best children’s hospitals. Riley Hospital ranks fourth in the nation in the number of children enrolled in clinical trials for all childhood diseases. Research has increased the 5-year survival rate from all children’s cancer from 10 percent to nearly 90 percent. Donations can be made to Riley Children’s Foundation (Riley Kids.org) to support pediatric research at Riley Hospital for Children.